THE FIRST REGISTERED FOOTBALL MATCH EVER TO TAKE PLACE ON THE ISLAND OF TARANSAY WAS WON BY THE VISITORS, THE REST OF THE WORLD TEAM. IN A CLOSELY FOUGHT GAME THE VISITORS COMPLETELY DOMINATED THE MATCH. 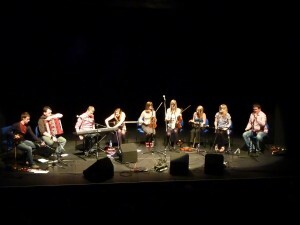 ALLAN HENDERSON (BLAZIN FIDDLES) REFLECTED ON A MAGNIFICENT PERFORMANCE – “WE WERE AWESOME!“. HOWEVER, THE CYNICAL NATURE OF THE STORNAWAY TEAM WAS CHARACTERISED BY WILLIE MACRAE’S CRUDE CHALLENGE ON CHARLIE MACKERRON (SESSION A 9). CHARLIE IS NOW RECOVERING BUT IT IS LIKELY HE WILL NEVER PLAY THE FIDDLE AGAIN! ALLAN HENDERSON’S SCREAMER FROM 25 YARDS WAS ONLY ECLIPSED BY ROBBIE LEASK’S FIVE GOAL Rout THAT HELPED SEAL THE HOME TEAMS FATE. DOLAN MORRISON WAS EXTREMELY LUCKY TO STAY ON THE FIELD OF PLAY AFTER TWO PARTICULARLY UGLY ENCOUNTERS WITH THE REFEREE (ALEC SUTHERLAND). IN FACT, MR SUTHERLAND WAS HEARD TO REMARK AFTER THE FINAL WHISTLE “I’LL NEVER DO THAT AGAIN!”. FOLLOWING THE GAME, THE TEAM MANAGER OF THE ISLAND TEAM, MURDO JOHNSTON, LEFT BY MUTUAL CONSENT. THE CAPTAINCY OF THE STORNWAY TEAM (DOLAN MORRISON) IS UNDER QUESTION AND AN ANNOUCEMENT FROM THE CLUB IS DUE SHORTLY. THE REST OF THE WORLD TEAM COMPLETED A MEMORABLE EVENING ON TARANSAY WITH A VICTORY CELEBRATION ON THE ISLAND THAT WENT ON THROUGH THE NIGHT. Buidheann tàlantach bheothail de dh’òigridh a tha seo ‘s iad air an treas bliadhna aig an sgoil chliùiteach an Glaschu – Acadamaidh Rìoghail Ceòl ‘s Dràma na h-Alba. A spectacular mix of virtuosity and vibrancy, this young group of performers are the 3rd year students on the BA Scottish Music course at the highly acclaimed Royal Scottish Academy of Music and Drama in Glasgow. Formed in 2007, ‘Year 3’ are united by a love of traditional tunes and songs, combining fiddles, highland and border pipes, flutes, whistles, piano, guitar, voice, harp, cello and accordion to create their eclectic sound. 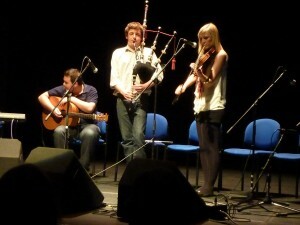 No strangers to the Scottish music scene, the group includes accomplished talent like Paul McKenna, whose self titled band recently won Best Up and Coming Act at the Scots Trad Music Awards 2009, and piper James MacKenzie, a finalist of the 2008 Young Traditional Musician of the Year Awards. Over the summer, both Lynsey MacRitchie and Lauren Weir played alongside Paolo Nutini and Phil Cunningham at the high profile festival T in the Park and again played alongside Phil at the 2009 BBC live broadcast at Hogmanay. Directed by Phil Cunningham, the group are currently recording an album with all 4 year groups of the BA Scottish music course. Year 3’s dynamic sound and energetic performance pushes convention while continuing the path of tradition.